Hang on to your hats and get ready for a spook-tacular good time with Curious George - in his first-ever Halloween movie. Autumn is here, bringing colourful leaves, hay rides, pumpkin patches, and the annual Boo Festival. After hearing about a legendary scarecrow who steals hats, the inquisitive monkey and his friends set out to find him. By the time George gets to the festival, he realises that it’s not always easy to pick the perfect ..
Own Curious George - Anniversary Boxset DVD from Deff, DVD, Blu-Ray & 4K Video Specialists - Free UK Delivery..
Second animated sequel to 'Curious George' (2006), based on the classic children's books following the adventures of the inquisitive chimp. This time around, George (voice of Frank Welker) is sent on an important space mission but a mix-up during launch has him crash-land in the middle of an African jungle. As a search party is sent out to locate the ship, George makes friends with a number of the jungle's inhabitants and ends up on a d.. When Curious George meets Kayla, a magician's homesick elephant, he decides to help her visit her brothers and sisters in California. But when the magician's dogged security chief, Danno Wolfe, becomes convinced George has masterminded an elephant 'napping, he begins an all-out investigation to track down the missing pachyderm. With Wolfe hot on their heels, George, Kayla and Ted (The Man with the Yellow Hat) travel by train, truck and ..
Collection of 16 animated adventures following intrepid primate Curious George (voice of Frank Welker), narrated by William H. Macy. In 'Zoo Night and Other Animal Stories', Curious George lets his inquisitive nature get the better of him, leaving his friends with the job of keeping him out of trouble. In 'Rocket Ride and Other Adventures' George's curiosity takes him down hills, up rivers - and even into outer space. Of course, The Man.. 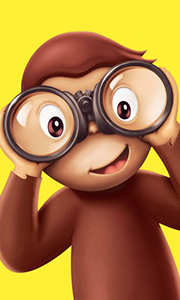 Curious George is curious about all kinds of things - he loves to explore, build and play. And when George dives in, he sometimes ends up with more than he can handle. But he always manages to pull himself out of any jam and sometimes even saves the day. Featuring 8 episodes from the hit TV series narrated by William H. Macy (Seabiscuit, Pleasantville), Curious George: Zoo Night and Other Animated Stories will entertain you over and ove.. Your favourite little monkey, Curious George, comes to life for the first time in an all-new animated movie featuring the voices of Will Ferrell and Drew Barrymore. The world's most mischievous monkey is out of the jungle, out on the town and out for adventure! Packed with fun, exciting and entertaining adventures, Curious George is sure to have you laughing over and over again!.. Own Curious George - A Very Monkey Christmas + Christmas Decoration DVD from Deff, DVD, Blu-Ray & 4K Video Specialists - Free UK Delivery.. Curious George and The Man With The Yellow Hat are having a very merry time counting down to Christmas. There's only one puzzle: neither of them can figure out what to give the other for a present. The Man is having trouble reading George's wish list and George doesn't have a clue about what to get for The Man who has everything. Will they be able to find the answers before Christmas morning?.. Own Curious George - Egg Hunting DVD from Deff, DVD, Blu-Ray & 4K Video Specialists - Free UK Delivery.. Curious George returns with another set of non-stop adventures. This time, George's curiosity is taking him down hills, up rivers and into outer space! And The Man with the Yellow Hat is always there to lend a hand, along with Hundley, Gnocchi and the rest of George's friends. Narrated by Primetime Emmy Award winner William H. Macy (Seabiscuit, Pleasantville), the fun is out of this world in Curious George: Rocket Ride and Other Adventu..
Own Curious George - Spooky Fun DVD from Deff, DVD, Blu-Ray & 4K Video Specialists - Free UK Delivery..
A high-flying springtime adventure! Spring has sprung and the world’s favourite monkey returns - as curious as ever - in this high-flying, full-length feature. George and his best friend, Hundley, explore all the wonders of the season together - including blooming flowers, baby animals and canoe rides. But when Hundley loses his way, George takes to the skies to find his pal, in a wild adventure that ends with a very fun surprise!.. Curious George: Rocket Ride And Other Adventures: Curious George returns with another set of non-stop adventures. This time, George's curiosity is taking him down hills, up rivers and into outerspace! And The Man with the Yellow Hat is always there to lend a hand, along with Hundley, Gnacchi and the rest of George's friends. Narrated by Primetime Emmy Award winner William H. Macy (Seabiscuit, Pleasantville), the fun is out of this world..